In today’s modern world, having an Apple Watch will keep connected while you are doing your activities. Wear an Apple Watch while you are jogging, playing golf, cycling, and more. If you are looking for a cheap Apple Watch, you can purchase them from popular UK retailers such as Amazon, Currys PC World, and Argos. 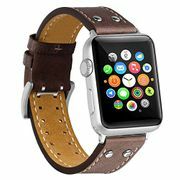 We at Latest Deals will provide you with the best cheap Apple Watch voucher codes to save money on your purchases. Choose from a wide variety of designs and colours available. You can save as much as 40% on selected Apple Watch models. 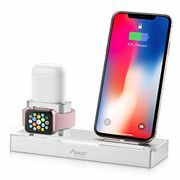 3 in 1 Stand for iPhone AirPods Apple Watch Dock Station Lightning Deal. All the cheapest Apple Watch Series and Acccessories in the UK! Designed and developed by the ever famous Apple Inc, Apple Watches were brought in to life. These smart watches were created to incorporate health oriented abilities and fitness tracking with the support of other apps and Apple services. Whether you are looking into buying a new set of Apple Watch or just planning to stock on some add on accessories, Latest Deals got your back. Our team of money-saving experts are always on the lookout for the best possible deals on Apple Watch. Take advantage of the coupon codes, voucher codes, and discount codes our community of bargain hunters have found, verified, and shared online. Get massive savings on your every Apple Watch purchase from any UK retailers such as Currys, Ebay, Argos, Very, Amazon, John Lewis, and Tesco. Never miss out on a single Apple Watch deal ever again! Make sure to check out Latest Deals daily for updated offers you can’t afford to miss and do not forget to bookmark this page for regular updates! There are a handful of reasons why you should opt to own an Apple Watch. Here are some of the few reasons why you should consider purchasing one. You get to have your own personal smart assistant on the go. Apple watches include Siri. You can even start up a conversation with her via the Apple Watch’s built in microphone. It’s customisable. You can easily change the style of your Apple Watch basing on your preference. Apple is offering various finishes, styles, and bands specifically made for the Apple Watch. The choices do not stop there as there are also third party companies working to provide other kinds of stylish bands. You can find various types of bands in different colours in the market today. It has a wide screen and thin edges giving the Apple Watch a brighter and bolder look. It’s recommended to own an Apple Watch if you already own an iPhone. It works smoothly with iOs making it easy to set up and use on a daily basis. Apple Watch is more lightweight compared to other smart watches. Apple always leave some room for improvement. It is evident on their innovative Apple Watches offers. Here are the different Apple Watch generations throughout the years. First generation. The first gen of Apple Watches only have 8GB of storage. It uses single core S1 system-on-chip. When Apple Watches were first launched, they still do not have a built in GPS chip yet. That means it relies to your iPhone location services. Even though the first gen watch seems to be outdated, it still has important and useful features such as a built in heart sensor. Second generation. This generation of Apple Watches have two different series. The first series called Apple S1P has a low start price rate even compared to the first gen. The second series or Series 2 features dual-core processor, GPS receiver, a brighter display, and water resistance to 50 meters. Third generation. It’s amazing how far Apple Watches have went from its first gen all the way to third generation. The third generation now has increased and improved RAM size, faster processor, and even a built in altimeter. With 3rd generation Apple Watches, you now have the option to speak with Siri smoothly with the help of the Watch’s improved processing speed. Apple Watch Series 3 only works with iPhone 5S and recent models. Currently, there are various Apple Watch series and types – from Apple Watch Series 3, Apple Watch Nike+, Apple Watch Hermes, Apple Watch Edition, all the way to Apple Watch Series 2. Apple Watch has accessories that can dramatically improve its overall features and appearance. Apple Watch Straps. Express your style and let your wrists do the talking. There are several strap types to choose from – from sport loop, sport band, woven nylon, leather to stainless steel. Aside from the strap types, there are various designs you should take in consideration as well. Mix and match away with these detachable watch straps. Stands, Power & Cables. These accessories may not look as important as they really are, but you’ll definitely go crazy without them. This accessory category includes power adapter, powerstation, charging cable, charging dock, and universal battery. Health & Fitness. Now, you can take your fitness and health experience to a whole new level with fitness trackers and health monitors such as thermometer, body scale, sleep monitor, home coach, and more. These accessories are compatible to health apps and are developed by various third party brands such as Beddit, Netatmo, Nokia, Spire, Tangram Factory, and Upright Technologies. Headphones & Speakers. This is a very useful and important accessory. Not does it only give you a different music listening experience, but it makes everything accessible including hands-free phone calls. You get to choose from various options such as airpods, bluetooth speakers, and wireless headphones compatible to Apple Watch. There are also quite a number of third party brands dedicated to provide the market with Apple Watch compatible headphones and speakers. Currently, you can find these type of accessories from popular brand names, including Bang & Olufsen, Beats by Dr. Dre, Bose, Devialet, Jaybird, Logitech, and Sonos. Apple has control of the prices of their products so there are minimal price differences among retailers. To mazimize your savings watch out for retail events such as Black Friday and Cyber Monday are the best times to purchase high costing items like Apple Watch. 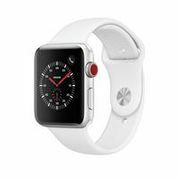 You can also get additional money off on your Apple Watch purchase by using the latest Apple Watch voucher codes here at Latest Deals where you can get freebies and free delivery from various UK retailers.